Retail Suite.ShelfSpace is a store shelf space management system. It enables you to automate and tune an efficient retail space management in your chain. It is an operational tool for a retail director, commerce director, planogrammer, merchandiser, category manager, and store assistants. It has an embedded scenario approach allowing you to manage several parallel running tasks simultaneously. The retail space of the chain should be efficient and manageable. To achieve this goal RS.ShelfSpace provides controlling for the set of indicators, reflecting the efficiency of retail space usage. When modelling retail space RS.ShelfSpace processes hundreds and thousands of objects: store fixtures including all the attributes, departments, sections, shelves, slots and separate SKUs. Retail space management is carried out centrally. Product display is provided based on system calculated visual guides according to the set rules. When generating planograms a stock reduction principle is supported providing the required level of service alongside; customer demand support algorithms change store planograms within a single click. The system comprehensively supports both regular and promo sales. Easy and comfortable operation with planograms and realograms, change history archiving. New store opening support. A shopfloor plan is created by new store opening business process; this plan is further kept actual considering all changes in the retail space and store fixtures. 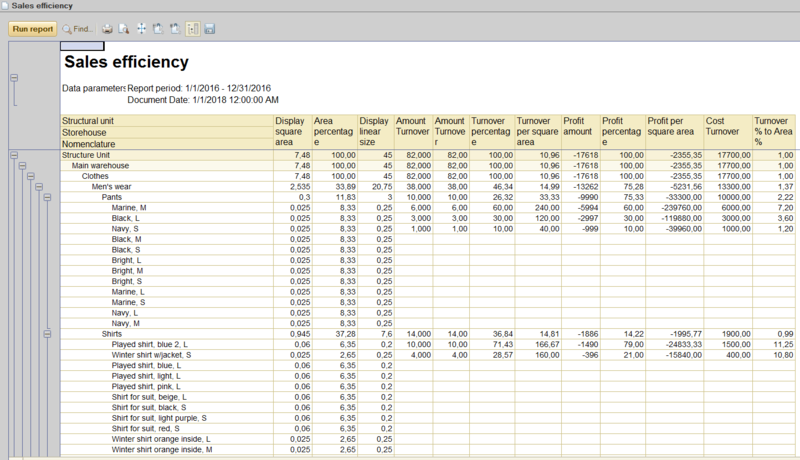 Last but not least, the system provides various analytical reports to estimate the retail performance. Unified product display in all chain stores. Capability to display products having high margin in specific “warm” areas. Capability to display products on a specific shelf based on sales history analysis but not according to the expert’s opinion. In the morning managers solve tasks to adjust planograms according to the changed product status. The senior manager activates the procedure to approve adjusted planograms. This store employee takes a photo of the modified rack and sends the photo to Head Office through the web-portal. The manager in Head Office compares the adjusted rack planogram to the real data in the photo. SOA of the solution enables you to create full functioning, reliable and easy structured integration with other systems. It allows quick, trouble free and secure data exchange implementation.